This week we learned a bit about early Australian history. 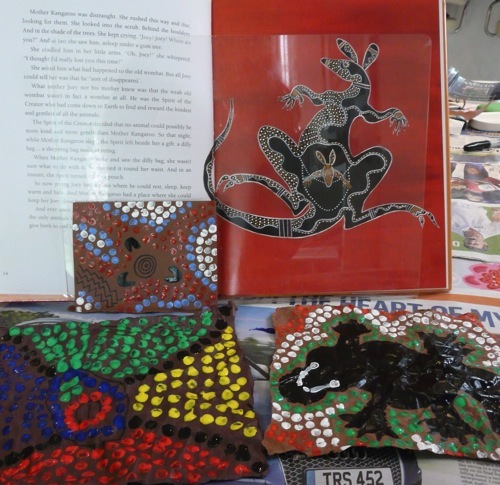 We read some lovely books and had fun making Aboriginal dot art paintings. 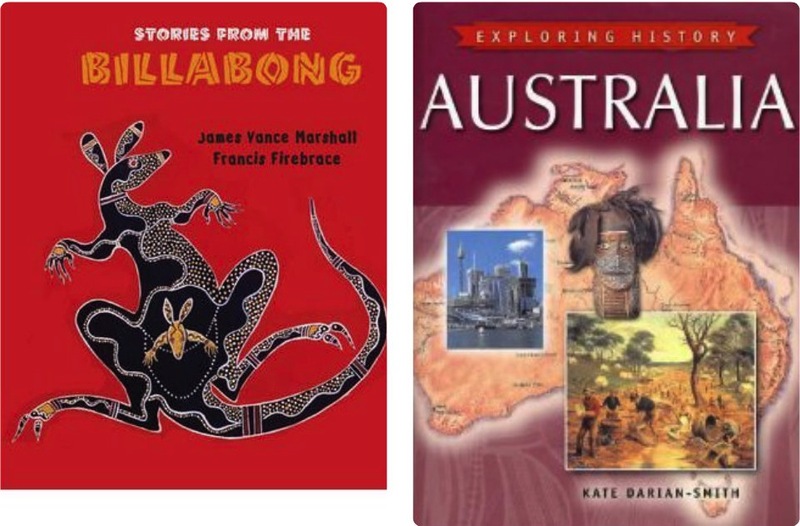 We began by reading Explore History: Australia, which explains how the earliest settlers came to Australia from South-East Asia when the continents were still close together and Australia was only a few hundred kilometres from Indonesia. 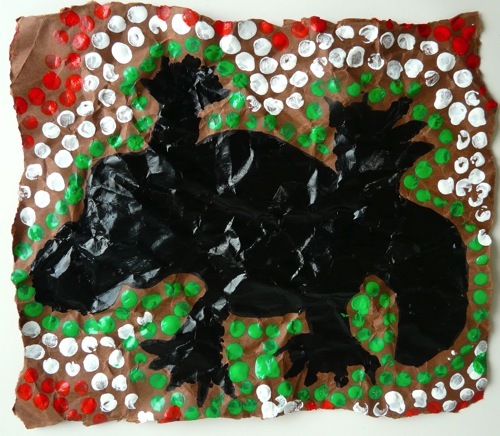 We read the about the Aboriginal Dreamtime, including the Rainbow Serpent creation myth, in Stories From The Billabong. These are stories are short and sweet, and beautifully illustrated with dot paintings. The book includes a section on the symbols that are used in Aboriginal art. 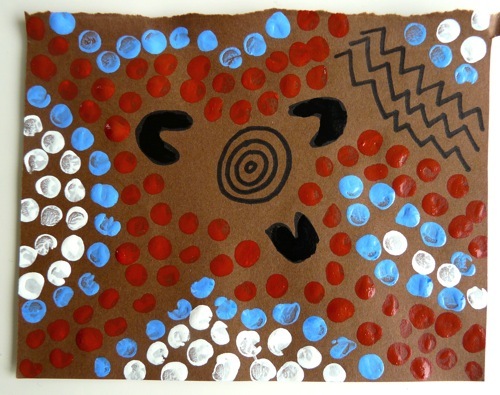 Aboriginal Painting – What Do All Those Dots Mean? 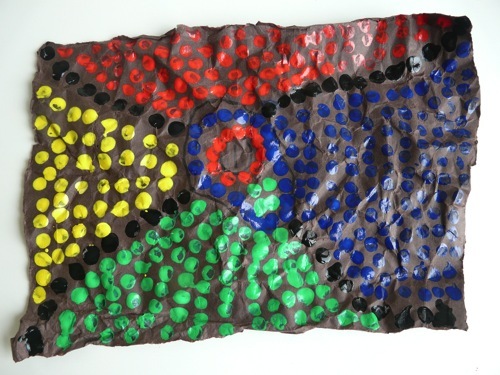 … Aboriginal paintings often resemble a map of sorts. Traditional symbols are used to represent water, waterholes, clouds, stars, fire, cliffs and sandhills. There are also symbols that represent people, especially people sitting, alone or in groups, and often in front of a fire or camp site. The painted dots in Aboriginal art can be symbols too, but they are also often used to obscure rather than add meaning – the secrets of the Dreamtime are closely guarded, so dots are added to paintings to conceal sacred symbolism from the uninitiated. 1. Tear around the edges of your paper to make them rough. 2. Scrunch up your paper and unfold it several times. This makes it look tree bark or rock. 3. 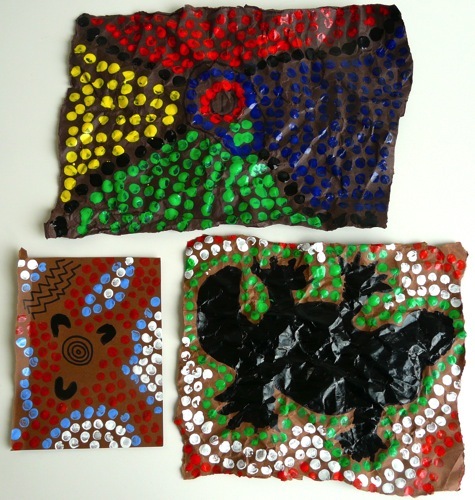 Have a look at some examples of Aboriginal Dot Art and the traditional symbols it uses, and get dotting! 4. Keep dotting until your page is filled. This takes some patience, because you need to dip your stick in the paint after every two or three dots. But it’s satisfying work, and combined with some traditional Australian music (see below), even quite meditative. We were inspired by this tutorial which suggests using an animal as the central image. Stories From The Billabong mentions several Australian animals that we weren’t familiar with, and we enjoyed looking them up and finding out about them. The children now know that, unlike Perry on Phineas and Ferb, a real platypus does not have a flat head. Next time we might use tempera paint rather than acrylic to colour the central animal, for a less shiny effect. Acrylics work perfectly for the dots, though. We listened to some gorgeous didgeridoo music as we painted. So soothing – I might play this more often! Oh, how I love your posts! This is wonderful! Yours turned out so great! My kids were not as patient when we did them. I love the bright colors, too. Makes me want to try again! Ah, thank you so much, Phyllis! You are so sweet. I love projects that turn out colourful, too – and they look great on display! This looks like so much fun! We love neat arts and crafts. Thank you for sharing! It was fun! Thanks for stopping to say hello, Lara! They have paintings similar to this in the cancer ward where my daughter gets her treatment. They are really cool. I had no idea they were Aboriginal. Thank you for sharing this. I pinned it for our future Australia studies. I wish I had seen this when we studied Australia last autumn. It would have been such a good hands-on project! I like your designs. They sure look like works of patience, with the dots and all. 🙂 And thank you for the link to the music. It is indeed very meditative. I now have new music to relax/meditate to! Glad you liked the music, it’s lovely isn’t it? I used to use Aboriginal music to help induce trance when I was working with hypnotherapy clients! I love that you researched hypnotherapy out of interest and curiosity – we’re kindred spirits! Oh yes, please! I’m sure they’ll make interesting posts. NLP is another interesting topic. You make me laugh!! Your poor siblings…your poor mum!!! I love these paintings! What fun to do. I think I will let Keilee try these. It reminds me ‘in a way’ of Georges-Pierre Seurat and his Pointillism. This has given me an idea for a little study. I have always wanted Keilee to watch “The Gods Must be Crazy” and we can do that and do your paintings! Thank you. Thank you, Karen! I know what you mean about Pointillism – I hadn’t made that connection, and I like connections! 🙂 Love the idea of watching the movie and then painting – what fun! I love the platypus. His black body with the other vibrant coloured dots are stunning! Those paintings are fantastic, another great way to reinforce understanding. Thank you! Yes I think the children will remember the fun they had learning about the first Australians. Thanks, Susan. Yes, I love it when connections happen spontaneously. My favourite kind of learning! I love how you did this. This is one of the projects I have chosen for Art next year… but I think I will dress it up a bit now – in a more cultural experience. Thank you for being so thorough and talented frankly! Thank you so much, Emily, you are very kind! It really was so quick and easy to add the extra cultural bits. I hope you enjoy it as much as we did! Thank you SO MUCH for taking the time to say hello – I really appreciate it. I’m having one of those days where neither of my kids seem keen to do much so it’s LOVELY to (a) be reminded of all the fun things we do and (b) feel like I’m part of the inspiration flowing around this wonderful online community! This is such a great post. I would like to invite you to link up this post to my Money Saving Monday Link Up so others can find this great idea. Please stop by and link up. What a great activity, and they turned out beautifully! So interesting, I didn’t know the meaning behind the symbols, or that the dots were often used to obscure the meaning! I do remember reading that the perspective in Aboriginal art is totally different than in Western art – usually it’s looking down from above instead of from the side as I am used to. Thanks for sharing at the Culture Swapper! Thanks so much, Leanna – for your kind words and the feature! 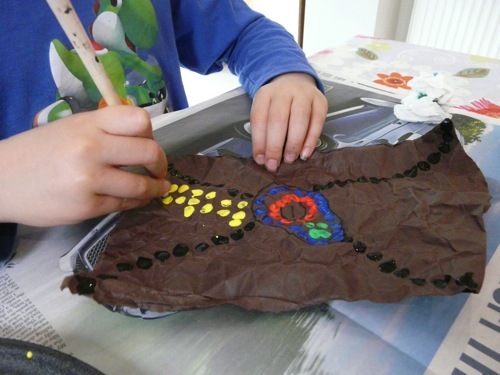 I’m so pleased to have come across your Culture Swapper linkup, it’s full of the kind of activities we love to do. What a great post! Thank you so much for linking at the Creative Kids Culture Blog Hop #3. Thanks, Frances! I love the Creative Kids Culture Hop, thanks for hosting it ! 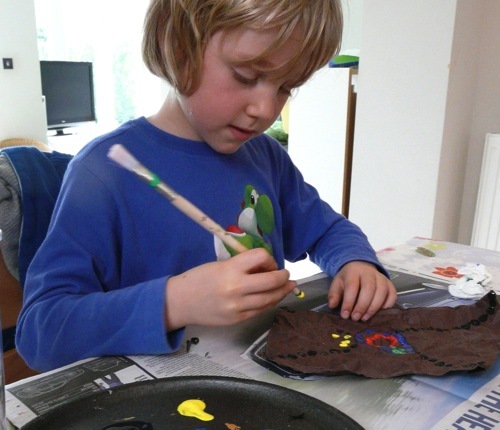 What a cool project – I’m pinning this so I remember to try it in our homeschool! 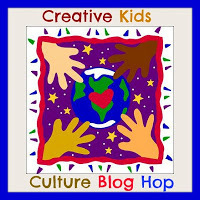 Thank you for sharing at the Creative Kid’s Culture Blog Hop! I loved this post so much that I featured it on the Creative Kids Culture Blog Hop that went live today. Please stop by to grab your “featured on button” and to link up more of your great content! Thank you so much! I’m honoured, there were so many great posts linked up! Thank you so much, JJ! We really enjoyed finding out more about Aboriginal culture. It’s definitely something we’ll revisit!